Originally I had intended on doing a followup post on my Getting Started with Deep Learning Guide, but due to some unfortunate personal events, I wasn’t able to complete the blog post. But don’t worry…I still have a really great tutorial for you today! Bad tutorials are worse than warm beer. But you can spend hours going down the wrong path when reading a misguiding tutorial. And that’s my inspiration for this post — I really hate all the blog posts I’ve seen that detail how to find the brightest spot of an image using OpenCV. You see, they are leaving out a single line of code that is absolutely crucial to being more robust to noise. Now, if you’re like me, that doesn’t sit well. So sit back. Relax. And know that you’re about to read a good tutorial. You won’t spend hours wasting your time here. 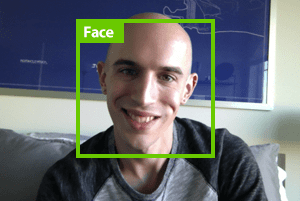 In this blog post I’ll show you how to find the brightest spot in an image using Python and OpenCV…and I’ll show you the single line of pre-processing code you’ll need to improve your results. A few weeks ago a PyImageSearch reader wrote in and asked about the best way to find the brightest spot in the image. You see, they were working with retinal images (see the top of this post for an example). These images are normally orange or yellowish in color, circular, and contain important physical structures of the eye, including the optic nerve and the macula. This reader wanted to know the best way to find the optic nerve center, which is normally the brightest spot of the retinal image. To find the brightest spot of the image using Python and OpenCV, you would utilize the cv2.minMaxLoc function. However, the term “spot” here is a little misleading. The “brightest spot” of the image according to cv2.minMaxLoc actually isn’t a region — it’s simply the brightest single pixel in the entire image. This means that the cv2.minMaxLoc function is extremely susceptible to noise if you don’t take the necessary pre-cautionary steps. A single bright pixel in an area where there wouldn’t normally be a bright pixel (in this case, an area other than the optic nerve center) can dramatically throw off your results. Instead, you are better off examining regions of the image, rather than a single pixel. When you examine regions you let the average balance everything out — and you’re less susceptible to noise. So how do you mimic this “region” effect without explicitly examining each and every region of the image? Open up your favorite editor, create a new file named bright.py , and let’s get started. On Lines 2-4 we’ll import the packages we’ll need. If you’re a regular PyImageSearch reader, these packages should feel like old hat to you now. We’ll use NumPy for numerical processing, argparse to parse command line arguments, and cv2 for our OpenCV bindings. From there, we’ll parse our command line arguments on Lines 7-11. Nothing too special here. The first switch, --image , is the path to the image we are going to find the brightest spot in. The second switch --radius , is an integer indicating the radius of the Gaussian blur we are going to apply to the image. It’s important to note that this radius value must be odd and not even. Next up, lets go ahead and load the image on Line 14, make a clone of it on Line 15, and convert it to grayscale on Line 15. The susceptible method to finding the brightest spot in an image is to use the cv2.minMaxLoc function without any pre-processing. This function requires a single argument, which is our grayscale image. Then, this function takes our grayscale image and finds the value and (x, y) location of the pixel with the smallest and largest intensity values, respectively. To break it down: minVal contains the smallest pixel intensity value, maxVal contains the largest pixel intensity value, minLoc specifies the (x, y) coordinates of minVal, and maxLoc specifies the (x, y) coordinates of maxLoc . In this application, we’re only concerned with the pixel with the largest value, so we’ll grab that and draw a circle around the region on Line 20 and display it on Line 24. The biggest problem with this method, and why I call it the susceptible method to find the brightest spot in an image, is that it’s extremely susceptible to noise. We’ll apply a Gaussian blurring through a pre-processing step. Like I mentioned above, using cv2.minMaxLoc without any pre-processing can leave you extremely susceptible to noise. Instead, it’s better to first apply a Gaussian blur to the image to remove high frequency noise. This way, even pixels that have very large values (again, due to noise) will be averaged out by their neighbors. On Line 28 we apply our Gaussian blur with the supplied radius from our command line argument. Then we once again make a call to cv2.minMaxLoc to find the brightest pixel in the image. However, since we have applied a blurring pre-processing step, we’ve averaged all pixels together with the supplied radius of each other. Doing this allows us to remove high frequency noise and leaves cv2.minMaxLoc substantially less susceptible. By using a larger radius we’ll be averaging over a larger neighborhood of pixels — thus mimicking larger regions of the image. And by using a smaller radius we can average over smaller regions. Determining the correct radius will heavily dependent on the application you are developing and the task you are trying to solve. Figure 1: Detecting the brightest area of a retinal image using our naive and robust methods. The results are good and look quite similar. On the left we have the susceptible method using cv2.minMaxLoc without any pre-processing and on the right we have the robust method. Figure 2: Adding a single bright pixel to the image has thrown off the results of cv2.minMaxLoc without any pre-processing (left), but the robust method is still able to easily find the optic center (right). Now, the naive cv2.minMaxLoc method finds this white pixel. Let’s be clear. The function is working correctly. It is indeed finding the single brightest pixel in the entire image. However, this really isn’t what we want. We are interested in the brightest region of the image, which is the optic nerve center. Luckily, by utilizing a Gaussian blur, we are able to average a neighborhood of pixels within a given radius, and thus discard the single bright pixel and narrow in on the optic center region without an issue. Obviously, a big aspect of getting the robust method to work correctly is properly setting your radius size. If your radius size is too small, you won’t be able to find larger, brighter regions of the image. But if you set the radius size too large, then you’ll be detecting too large of regions, missing out on the smaller ones, leading to sub-par results. Definitely spend some time playing with the radius size and viewing the results. In this blog post I showed you why it is critical to apply Gaussian blurring prior to finding the brightest spot in an image. By applying a Gaussian blur, you are averaging the pixels within a given radius of each other together. Taking the average allows you to remove high frequency noise that would have otherwise thrown off the results of the cv2.minMaxLoc function. Be sure to explore appropriate values for the radius of Gaussian blur. If you take too small of a value, you’ll mitigate the effects of the average and miss out on the larger, brighter regions. But if your radius is too large, you won’t detect the small bright regions. Nice tutorial. However I think there is a different approach (more similar to finding the brightest pixel) that may also work, without having to write your own method. That said, I like your method better. However, I think that usually when people learn to find peaks, they have it drilled into them to filter first, for exactly this reason! Hi Jeremy, thank you for commenting. Great point — using a filter prior to finding the brightest pixel is a good idea. Given that this is an introductory post, I think using the Gaussian blur is a better idea and easier to understand. I’m going to go back and update the post. Hello Adrian, Great to see the post! I want to detect the hot point in my thermal Video. How can I get the exact temperature and is there any method to compare two videos according to the characteristics? If you are using the same thermal sensor to capture the temperatures (and therefore know what temperatures of various color bands are) then yes, it would be possible. This solution would involve color thresholding. Nice example ! I am working on something similar like draw circle only if the bright spot found. Else no circle.One way is to use threshold, if min_val < threshold then draw rectangle. But in my case i am not able to decide threshold values between 0-1.my min max values are something like 221462064.0 and 758624512.0 respectively.I want to work this for other images too. Can u show how can i do it or may be some other method to do it? Hi Emma. You could always scale your values into the range [0, 1] first by dividing my the maximum value that occurs in your image. But not really wouldn’t be a fix. It seems like you are trying to accomplish some sort of adaptive thresholding based on the brightest parts of the image. Without seeing your images (and getting more details), I can’t really provide a solution to the problem. Can you tell me how to find out the darkest region in the image, but only within the circle(eye)? And do you have any thoughts on using kernels to find the darkest and brightest regions of the image? How would you do that? I believe using a kernel would greatly help in removing any errors. Hi Azrael, to find the darkest region of the image simply take a look at the minVal and minLoc values. And to only find the regions within the actual eye, you just need to specify the ROI (Region of Interest) that you want to investigate — which is in this case the eye. Take a look at this blog post on OpenCV basics to learn how to crop the image. You can then take this cropped image and find the min/max values. Also, a Gaussian kernel (for blurring) has already been applied (Line 28) to the image prior to finding the min/max values. This helps reduce noise and improve results. then how would I do that ?? Hi Tuhin. If you want to find the mean intensity of the brightest region of the image, you could use cv2.minMaxLoc as I did in the example. Then you would extract an M x N pixel region surrounding the brightest region. And then call cv2.mean on that region — that will give you the mean intensity of the brightest region. How should I extract MxN region ? How to find the values of M an N? You need to determine the values of M and N yourself. For example, you could extract a 20 x 20 pixel region, a 10 x 10 pixel region, etc. That decision is entirely up to you. Take a look at this post to learn more about cropping and extracting regions from images. 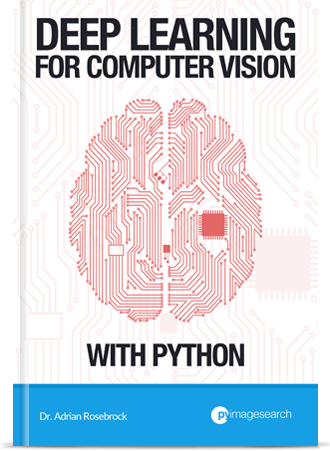 I would also suggest taking a look a my book, Practical Python and OpenCV. It will definitely help jumpstart your OpenCV education! Cheers. 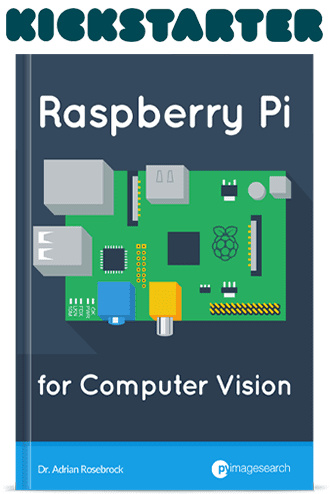 I would like to ask if the method mentioned above can be applied to a live feed video in the previous tutorial “Accessing the Raspberry Pi Camera with OpenCV and Python”. It certainly can! You just need to update the Accessing Raspberry Pi Camera code, specifically the for loop where the frames are being accessed, to apply the techniques proposed in this post. Hey Adrian. Could you please explain in detail on how to set this code up for a live video tracking ?? It depends on what type of camera you are using (webcam or Raspberry Pi camera module), but the gist is that you should start with this blog post and then use it as a template to access your webcam. From there, detect the brightest region in each frame. i understand why blurring works in this specific instance. would there be any instances where you simply filtered by size? (eg, find pixels above a certain value and then simply ignore anything less than N pixels). Certainly! A great example is in this post on target detection. Notice how I ignore any regions of the image that are smaller than 25×25 pixels. Why not use: orig = image? Also, must the image be PNG format or will any other format work such as JPG, BMP, etc.? If you’re getting an error related to the image being None, then your image is not being properly loaded from disk via the cv2.imread function or the path supplied the cv2.imread is not valid. OpenCV comes with built-in support for reading BMP images, but you need to install the appropriate JPEG and PNG libraries for your system prior to compiling and installing OpenCV. can you explain on how to remove debug this error now ?? When I copied your code verbatim I encountered an error with image.copy(). I was able to get around it by simply replacing this line of code with: orig = image. I’m using OpenCV 3.0.0 so I’m not sure if that was the issue. I thought I should post this to help anyone else who might be having the same issue. Digging a little deeper, I didn’t quite understand the purpose of making a copy of the image. I commented out the image.copy lines of code completely and the program seems to work just fine. Can you add some detail as to what the image copy was for? This certainly helped me to understand what was happening during the Gaussian blur process as the radius changes. Thanks again for the great tutorials! The .copy() method is used to make a deep copy (rather than a shallow copy) of the image. This allows us to “draw” the circles on two separate images and display our results. If you’re using this code in an image processing pipeline, you can certainly leave it out. Hi! Is it possible to detect multiple bright spots in an image and find their pixel coordinates? thanks! Indeed, it is possible! I plan on covering it in a future blog post, but in the meantime, take a look at this tutorial with scikit-image. I’d be really interested in such a tutorial as well. Hi Ardian! Nice tutorial there, really helpful tutorial. I am working on a project that requires a raspberry pi doing image processing and finding a traffic light. Once its been found, monitor it until it goes off, and as soon as it does, send appropriate commands to the Arduino(which controls motors). Now since at the moment I don’t have a RPi, I’m writing the code on my PC(Windows 8.1), the PC version of my code, detects a light from the frames captured from my Webcam, and when the light goes off, display a message on the screen, when it comes back on, display the corresponding message. I plan to convert the video captured from the webcam into greyscale and then finding the brightest spot(hopefully the light). Now can you please tell me how to display a message (and send command to Arduino too of course), based upon the detected status of the light? I’m new to Both OpenCV and Python, but I’ve been coding in other languages so thats not a problem. I’ve literally spent entire nights reading up the OpenCV documentation(I was initially writing the code in C++, but realized that I should switch to python as ultimately I have to use this on a RPi) and writing code. I’m in real need if help! Your project sounds very cooL! However, I have never done any Arduino-based development before, so I’m unfortunately not the right person to ask regarding this question. In the future, I’ll try to do more GPIO and Arduino posts that cover computer vision topics as well. Okay fine, no problem. Anyways if not Arduino based, can you tell me how to display the corresponding message depending upon the status of the brightest spot(the light being on or off) simply in python? Thanks again for such a nice tutorial. And yeah, is there any way to make a trackbar to control the Guassian blur radius? Like there are in C++ Visual Studio tutorials for OpenCV object detection based on color where they convert the image to HSV and then control the H,S and V values with trackbars until they get the required binary output in the resultant window. I’m thinking that controlling the Guassian blur with a trackbar would be a good idea as in my case I’m working with a live video feed from my webcam. What do you think? Hi Adrian! Sorry to harass you with so many comments, but I thought I’ll post back with my most recent experiment towards my project. Okay so I did a bit of modification to your code and got the bright spot detection to work from my webcam feed. I ran the test in a room brightly lit and detected LEDs of a spare webcam I had lying around. It was quite successful(just while testing with some extreme angles it detected the collar of my white shirt as the brightest spot). Any ways, since I have to do the actual detection in sunlight, will this method work? I mean I don’t want my robot to see any other “bright spots” other than the traffic light just before a race is about to start. I can’t experiment right now as its night here in world. All comments have to be manually approved by me, so please make sure you consolidate your comments whenever possible. To address your questions, yes, you can create track-bars to manually control the Gaussian blur radius. Please see the range-detector script for an example of using a trackbar. As for changing your lighting conditions, that is entirely dependent on your environment. You won’t know until you try. But in short, if there is a brighter spot in your image (brighter than the LEDs), then yes, the code will (incorrectly) detect the brighter object. In that case, you need to build extra logic into your code to prune the false-positive cases. I would suggest looking into color thresholding and contour properties (solidity, extent, aspect ratio, etc.) to prune these regions. Thanks! You’re a great help buddy! If you can use the HSV color space to help filter your object, then yes, absolutely do that. You’ll likely need to experiment with this approach and see if you can filter each channel or use something like cv2.inRange to filter for a specific color. And yes, this method is intended for use on single channels, but if you can filter out extraneous regions and then only examine the Value channel (which will store the intensity of the color), then you can get around this problem. As for using Python or C++, I nearly always suggest prototyping in Python and then only coding in C++ if absolutely necessary. Very well, sounds like a plan. Now the only question that remains is , since I don’t know how to do this in either Python or C++, how do I display a message on the screen once the desired circle(the traffic light) goes off(or comes back on)? And yeah what to you mean by “coding in C++ if absolutely necessary”. What do you mean by “display a message on the screen”? You could use the print statement/function to write text to the terminal or you could use cv2.putText to draw a message on the actual image. Well displaying a message in the sense that as soon as the detected spot goes black in my binary image, show a message on the screen. What’s the statement for that? Please see my previous comment — use either the print statement/function or cv2.putText. Yeah that print statement is fine. But there should be some condition checking statement there too, right? Like if (*as long as light is detected*). How do I check for the “visibility” of the light? Or, if no conditional check is required, where do I write the print statement? P.S – sorry I’m still new to Python, so I’m not much proficient with the basics yet, but I’m learning! All thanks to you! Yes, a conditional is required to determine if there is sufficient light. You’ll need to program that logic yourself. Normally you would be looking for a large enough region in an image (based on width and height) that has the pixel intensity you’re looking for. 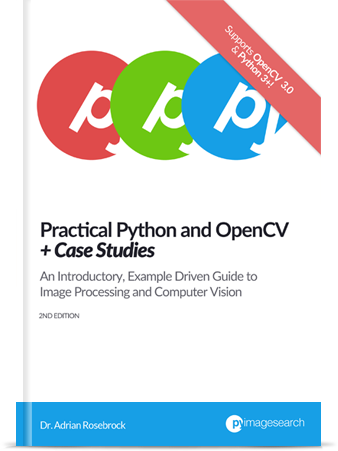 If you’re still getting used to Python + OpenCV, you should absolutely work through Practical Python and OpenCV to help you get up to speed quickly. Thanks for the tutorial – a great introduction to this area! I’ve a couple of questions. What does the radius value refer to? Is it pixels? What would be the best way to find the 6 (for example) brights area’s on an image? Could you set a brightness target threshold and search for that (along with the radius value)? The radius is the size (in pixels) of the Gaussian blur. The smaller the radius, the less blur. The larger the radius, the more blur. As for finding multiple bright spots in an image I actually have a blog post scheduled for that. It will be published late October/early November so be sure to keep an eye out! the first step was to have robust hand skin detection. the image frames from webcam i have converted to HSV and ycbcr colour space,applied morphological operations on individual hsv and ycbcr thresholded images. could you suggest me how to remove non- hand skin regions. I would suggest detecting the hand first. You might need to apply other methods than just color thresholding such as object detection. I would also suggest contour extraction and filtering only the hand regions. hey thanks for the tutorial but i want to know how will you issue the command in cmd like how will you give arguments. sorry for the question but i m a beginner. Hi Saurav — You’re welcome. I suggest you read this tutorial on command line arguments. i have one small help how to find the crop the brightest region on your code please help me . You can extract the region using basic NumPy array slicing. i like to extract the logo from an image. can i apply this Gaussian blur method to get the logo. Or is there any other method. I will be highly grateful if you please let me know. You should look into object detection methods as well as keypoint detection and keypoint matching. 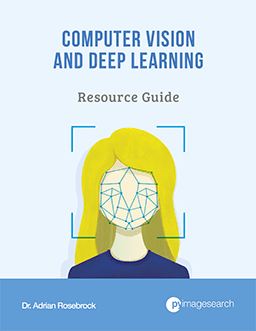 I would suggest reading through Practical Python and OpenCV to learn more about keypoint matching and then Deep Learning for Computer Vision with Python to learn more about deep learning-based object detection. I am working on a project using rasberrypi and rasberrypi camera where I am blinking a led at certain frequency and their are other Led lights which are continuously on ,so is it possible to frame by frame check (process) the frames simultaneously and circle the blinking led in the video as the video is static ( the position of the led is not changing for 1 complete video ) I am going to keep the frequency of the led and the fps of the video equal so checking (processing) frames will not be a problem , as I think the led will locate maxval in one frame and minval in second frame for the same location so is there any method to locate the blinking led with highlighting circle in real time . If the position of the LED is fixed and non-moving why not just monitor that specific area of the video frame? You could compute the mean value of the region and if it’s above a pre-defined threshold the LED is “on”, otherwise it’s “off”. Got it, I understand now. One way to frame this problem is via motion detection/background subtraction. Since all LEDs will be “on” and only the blinking one changes, you can monitor the frames for changes in background which in turn give you the ROI of the blinking LED. I hope that helps! how can we extract the region of an image consist of brightest pixels in its dark channel. You could use NumPy array slicing to extract the region — or perhaps I’m misunderstanding your question? actually sir i want a region in an image consisits of brighest pixels in its dark channel. Hi Adrian, thanks for this. I have a question though. How do i locate the center of the brightest “spot” within the cirlce and possible use a dot to visually indicate that? You would compute the centroid of the circle and then use the “cv2.circle” function to draw the dot. I cover both of those techniques inside Practical Python and OpenCV. I would highly suggest you start there.